If we value our forests, then we need an economy that values them, too. Dogwood Alliance has been the driving force of change among industries reliant on the resources of Southern forests since 1996. Ten years ago, we initiated a unique collaborative between conservation organizations, landowners and corporate partners like Staples, Forestland Group and Columbia Forest Products to innovate solutions that are driving the shift to a 21st century economy, that maintain and financially value our standing forests and the ecosystem services they provide. We called it the Carbon Canopy Project. The project came to an end in 2017 and our work has shifted focus, but there were many important lessons learned. Although this project differed dramatically from oft-critiqued global carbon schemes like REDD+, one important thing to note from our perspective is that Dogwood Alliance stands in solidarity with communities and indigenous people around the world in recognizing that climate mitigation schemes such as carbon markets can often enable ongoing forest destruction and/or fossil fuel pollution making them false solutions. Forests should not be used to “offset” fossil fuel emissions as that is simply an excuse to continue burning fossil fuels at a time when keeping fossil fuels in the ground is critical. In addition, we stand in opposition to any climate or forest protection solutions — including carbon markets — that jeopardize Indigenous or environmental justice communities or ecosystems. 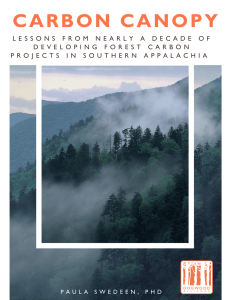 A report from the project, Carbon Canopy: Lessons from Nearly a Decade of Developing Forest Carbon Projects in Southern Appalachia, includes valuable technical, economic, and social knowledge that was gained and should serve as a roadmap for using the carbon market to protect forests and improve management in working forest landscapes. Carbon Canopy was a ground-breaking initiative that gave landowners financial incentive to preserve their forests so that they didn’t have to choose between clearcutting and conservation. The project placed real economic value on carbon sequestration and on ecosystem services, like climate change protection, clean air and water as well as biodiversity. With Carbon Canopy, companies developed a mechanism for doing something about their environmental impact, taking into account the real cost of doing business, and ensuring our forests’ ecosystem services endure. Ultimately the project led to increased protection for thousands of acres of forests in the Southern Appalachians and generated several new initiatives across the region. Watch Mark Buckley of Staples talk about how the unique partnership of the Carbon Canopy led to greater forest protection. Watch Kaarsten Turner Dalby of Forestland Group and Danna Smith discuss valuing and managing carbon in the forest landscape. Watch Jim Sitts of Columbia Forest Products and Danna Smith discuss lighter touch logging and better forest management. Read Danna Smith’s blog about how Carbon Canopy pioneered forest protection in the marketplace.